You can access the full content of The Chronicle of Higher Education Online FOR FREE Courtesy of the Loyola / Notre Dame Library! Here's how. 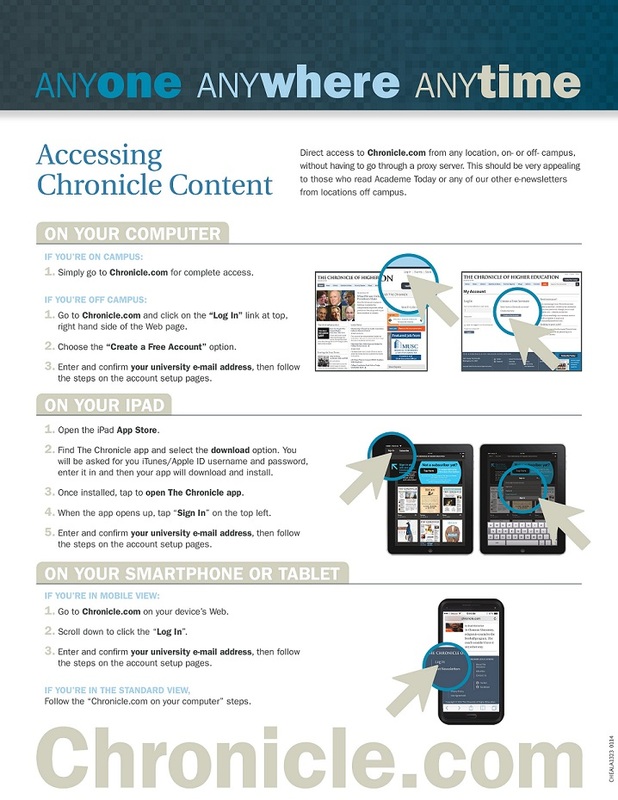 You can freely access all the online content of www.chronicle.com in several easy ways from both on and off campus. From on campus, simply go to www.chronicle.com and read any article you wish. You will not be asked to log in. From off-campus, go to www.chronicle.com. Click Log-In at the upper right-hand side of the screen. Then, follow the link to Create a Free Account. Use your @ndm.edu or your @loyola.edu email address to set up the account. After you set up your account, you will be able to access all the content of the Chronicle from off campus by logging into this account. 3. Go to the library's homepage (www.lndl.org) and navigate to the link for the Chronicle of Higher Education in the databases list (hover over "Search" and select "Databases").